​Life: Born educated in Italy,​ then 10 years in the States and 15 in France. I got to physics late: before I was more into the hippies dreams or trying to overthrow the Italian government. Professional: in my third university year I fell in love with the problem of quantum gravity, I drew a large colourful picture with 10^-33 at the center (the Planck length in centimetres) posted it on the wall of my room and decided that the rest of my life was to understand what happens down there, where space and time are no more. What was your inspiration for writing your recently published book “Seven Brief Lessons on Physics“? ​None. I was asked to do it. I had written three articles for the cultural supplement ​of an Italian newspaper. The most prestigious of the Italian publishers asked me to write a small book out of it. At first I thought it was a silly idea, then liked it. The book is NOT what it is advertised: it is not a condensed summary of contemporary physics. Not at all: it is a *very* personal take on physics. Most people that have read the book do not realise this, but the Physics Forum people certainly would. I describe general relativity, quantum theory, etcetera, as I see them, which is not exactly how they are usually taught. If there were an 8th lesson to your book “Seven Brief Lessons on Physics” what would it be and why? What do you think about supersymmetry, and do you expect it to be found soon (and if yes, where)? ​Look: I was 30 when I was first told that we were going to *certainly* see supersymmetry ​*very soon*. Now I am 60. And for 30 years I have been told that we were *certainly* going to see supersymmetry ​*very soon* all the time through. Isn’t time to just mostly give up? I think so. Do you feel it is time for physics to give up on the “uni” in “universe”? ​Not at all. There are speculations, and I respect them. But I haven’t seen a single reasonable idea on how to actually ​test speculations about multi-universes, and without empirical test we are not doing science. Maybe it will come, I do not know, but for the moment we are well within the “uni”. What indications, if any, do you see that the natural world is simple and unique–even if different from today’s understanding of it? ​Very strong indications! We have discovered that the fantastic complexity of things seems to very largely follow super simple​ laws that we can write! If we find evidence against the project of writing simple laws, we will change it, but there isn’t any evidence that we have to, for now! What would you say are three physics insights that would make the greatest difference if they were assimilated into how we generally understand and think of the world? (1) ​That ​there is no “time” in the fundamental description of the world. (2) That “space” is not a container of things. (3) That there is nothing outside the natural world. What three future (as yet undetermined) insights or conceptual developments could make the greatest difference to theoretical physicists? Should we adjust our philosophy of science (e.g. the criterion of falsifiability) regarding the last few decades of theoretical developments? ​Look: the very last thing we should do is to adjust our best tool, just to cover our failures​. If there are theories that are not falsifiable, we should throw them away. A scientific theory cannot become just a house of cards that delivers nothing but university positions. If it does (and we are not far from that) we are doing something seriously wrong, which we are all going to pay hard. If so, does it make sense to criticize string theory based on methodological grounds when the theory suggests to alter these grounds? String theory was honest in the ’80s when it set clear aims to itself: compute the parameters of the standard model from first principles, explain why 3 generations, tell what happens at the center of a black hole, etcetera. If it has failed all these objectives, it is simply time to tell. Not to pretend we do not care. Your 60th birthday is being celebrated by a “carlofest”. How do you feel about this event and what are you excited for? Away from science what are some of your hobbies, favorite movies, books, place you’ve traveled? Who were your heroes growing up and why? ​Alen Ginsberg, Alexander the great, ​Spinoza and Che Guevara. Because they all thought the opposite of what people around them were thinking. 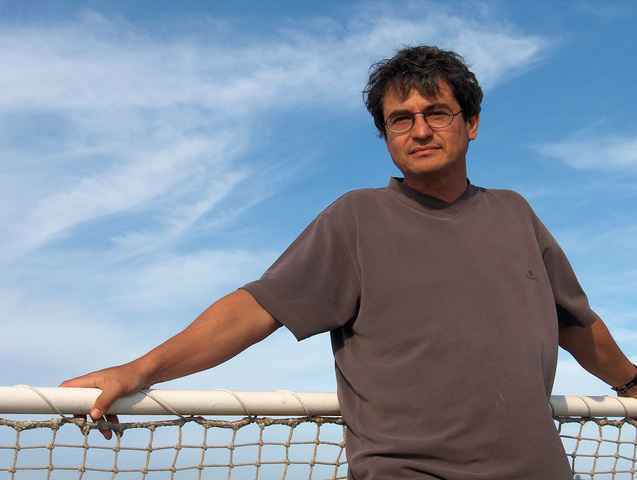 To learn more about Carlo Rovelli please visit his webpage or wiki. If you are interested in his new book, check it out on Amazon. What a complete waste. Don't you have any desire to ask him about, I don't know, his own ideas? Or any kind of substantive question at all, instead of just his competitors?I don't understand the desire to keep waging this battle against string theory, supersymmetry and every other idea other than what Rovelli works on. Surely nobody is illuminated by the entirely negative message, let alone convinced. Surely nobody is laboring under the misimpression that Rovelli's approaches have been any more successful at making unique predictions or being experimentally observed than his competitors – quite the opposite if anything.One is left with the impression that Rovelli's thoughts on physics are defined by what he is against rather than for, though I'm sure that has much to do with the terrible job by the interviewer. One also gets the impression the interviewer hasn't heard of anything interesting happening in theoretical physics over the past decade besides arguments about string wars and multiverses. I'm sorry if that's the case. Great interview!Thanks, Greg. It goes right to the heart of things I think Rovelli cares about and gives a sense of what he's like. You get a good idea of his views on some of the foremost issues facing science (in particular, physics) today. Just now I checked to the Amazon page for Rovelli's book. it www #9 among all the books Amazon sells:==quote==Amazon Best Sellers Rank: #9 in Books (See Top 100 in Books)#1 in Books > Science & Math > Physics#1 in Books > Science & Math > Astronomy & Space Science > Cosmology#1 in Books > Textbooks > Science & Mathematics > Physics==endquote==I've never seen a physics book rank that high. It's phenomenal! Surely some congratulations are in order. Great going Carlo! I guess I should give the link:http://www.amazon.com/Seven-Brief-Lessons-Physics-Rovelli/dp/0399184414/ref=zg_bs_13449_1I wonder if any of Hawking's books, or Kaku's ever placed that high. Great interview and beautiful book!